This is a vocational training report on Ultrasonic Proximity Detector undertaken under at Bharat Heavy Electrical Limited(BHEL)in partial fulfillment of the requirement for the Bachelor in Electrical engineering. The report covers topics like Making Printed Circuit Board (P.C.B.) 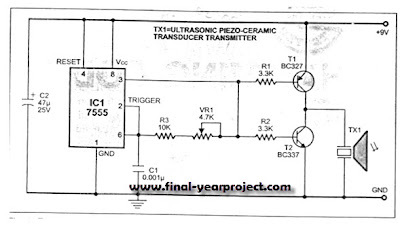 with full procedure, current-to-voltage convertor, voltage-to-current converter, ultrasonic proximity detector and its working. You can also Subscribe to FINAL YEAR PROJECT'S by Email for more such projects and seminar. 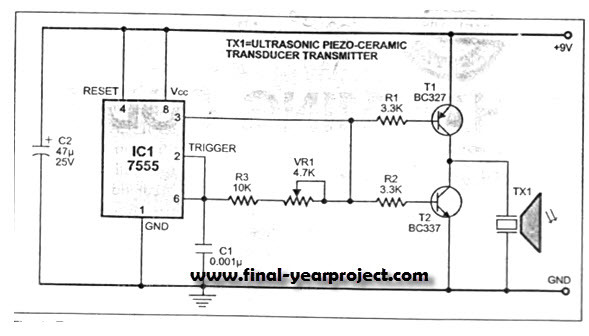 This ultrasonic proximity detector comprising independent, battery-powered transmitter and receiver sections makes use of a pair of matched ultrasonic piezoceramic transducers operating at around 40 KHZ each. Use it for your reference and study work only.